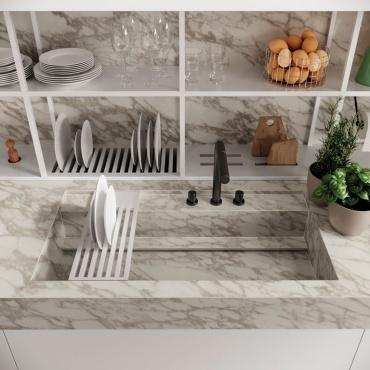 A characteristic and bold surface, pure white in colour, traversed by intense, powder gray veining. Calacatta Royal is characterized by imposing, majestic graphics, as its name suggests. Calacatta Royal comes in a thickness of 12 mm and is available in glossy lapped and silk finishes. Thanks to Calacatta Royal Bookmatch, visual continuity can be achieved across: kitchen islands, tables, backsplashes, worktops, side panels, bathroom vanity units and bar and restaurant counters. Calacatta Royal Habitat: Calacatta Royal slabs with lapped lux finish are paired with Kone Pearl by Atlas Concorde for the floors. These are complemented by essential objects and materials that fit perfectly with the minimalist design scheme.